Ravelry is having a knitting Olympics paired with the actual Beijing Olympics. I have a project that I have been dying to make that I will work on for that (more later). So, instead of starting something new, I am on a big finishing kick to get long knitted, but not sewn up projects done. This has been my project for this past weekend. My “Poems of Color” fair isle sweater that I made. I bought the yarn as a kit, so all of the colors and weights were correct. The yarn is 100% wool. It breaks fairly easily if pulled on, and it is a bit scratchy. I am hoping that it will soften up when washed. The pattern was fun to knit, and I worked it up fairly quickly. THEN IT SAT FOR YEARS. I had this fear of sewing the steek. I got my courage up this past winter when I had totally messed up a sweater, and thought, why not do all of my steeks now. So, I steeked 3 sweaters that had been sitting. And now I am working on sewing them up. Over the weekend I worked on the front bands and the collar. When I did this project, I did not have Ravelry to help keep my projects in order. So, while I had the pattern with me, I neglected to write down what needle size I used, and minor changes that I made. My gauge on the bands is much tighter, which I think is okay. 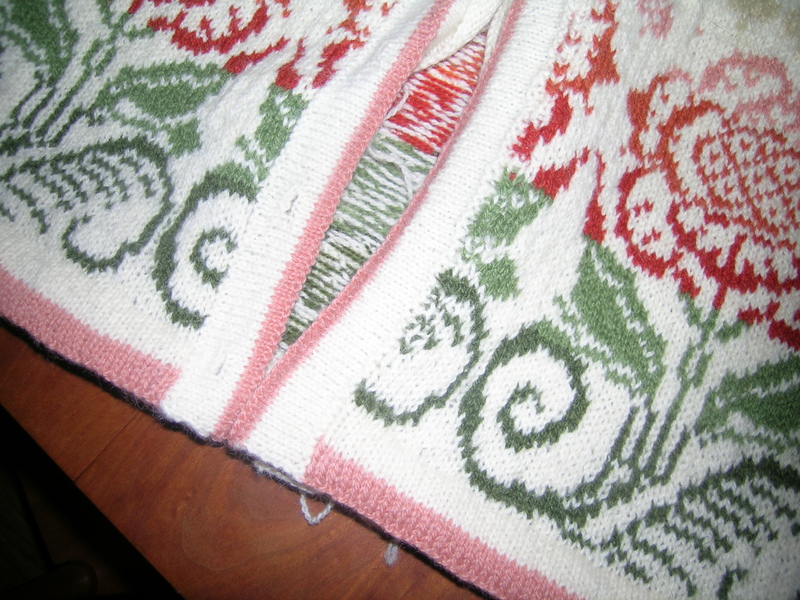 For the bottom of the sleeves and the sweater, I had added a turning row in reverse stockinette stitch. 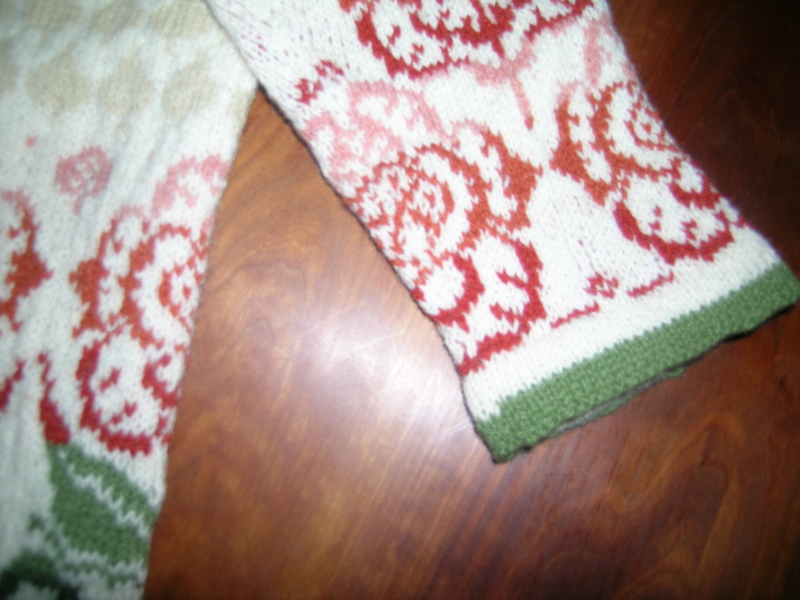 I did this also, on the bands, but knit one less row by mistake. I have decided to leave it, as it is a definite difference, doesn’t look like I was trying to match. With my gauge difference anyways, I would have never been the same, so just as well to be a bit off. When looking at the sweater critically now, I wish that I had gone down a needle size for the main body. I think that I had done the famous test swatch and thought that my sweater needed to be a bit bigger. The definition on the colorwork is not as crisp as I would like. 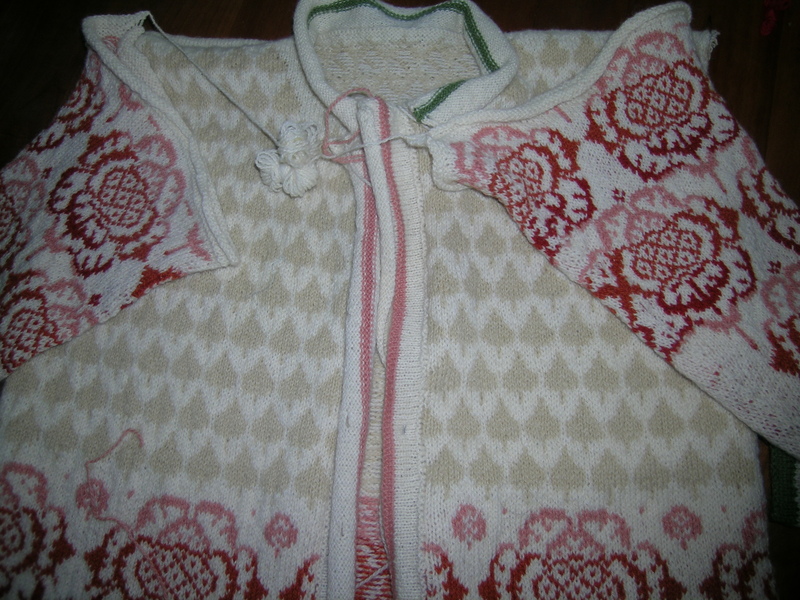 I know that I also knit this up with wooden circular needles, and I wonder if that impacted it a bit also. I knit the band up on metal circulars, and it is much tighter. Hope to finish this up in the next day or so, and then find the perfect buttons.